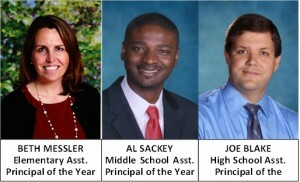 The Connecticut Association of Schools is pleased to announce the winners of the Assistant Principal of the Year Awards. Congratulations to these outstanding administrators! Each year, applications are accepted for the Elementary, Middle, and High School Assistant Principal of the Year awards. The winners are chosen by the CAS Awards and Recognition Committee, a selection committee consisting of active and retired principals and assistant principals. Elizabeth Messler, assistant principal of Coleytown Elementary School (CES) in Westport, has been selected as the 2014 CAS Elementary School Assistant Principal of the Year. Nominated for the award by Superintendent of Schools Elliott Landon, Messler was chosen by the selection committee for her purposeful instructional leadership and her uncompromising dedication to her students and school community. A warm, caring and reflective administrator with an unyielding professional focus, she has been a catalyst for change in teaching, learning, and assessment; and her efforts have helped build an engaging, supportive and professional learning community where all students can achieve at high levels. A tireless instructional leader, Messler serves as CES’ Response to Intervention (RTI) and Curriculum Administrator. With an ever-present focus on teaching and learning, she has helped staff to use assessment data as a tool to accelerate student learning. She instituted data teams which meet regularly to monitor the progress of individual students – as well as the school as a whole – so that curriculum and instruction can be tailored to address weaknesses and capitalize on strengths. Her skilled use of data-driven decision making has helped ensure that all CES stakeholders are consistently engaged in efforts and activities that ultimately lead to increased student achievement. Messler graduated from Union College (NY) in 1996 and went on to earn a master’s degree in elementary education from Manhattanville College (NY) and a sixth year certification from Sacred Heart University (CT). She has been serving the Westport Public Schools for the past ten years, first as a classroom teacher, then as a math and literacy coordinator and, ultimately, as an assistant principal. She began her career in education in 2002 after leaving a successful career in business to pursue her passion for working with children. Albert Sackey, assistant principal of Western Middle School (WMS) in Greenwich, has been named the 2014 CAS Middle School Assistant Principal of the Year. Described by WMS Principal Gordon Bernstein as “an organized, hard-working, committed visionary,” Sackey is a 13-year educator whose successes are founded on his passion for learning, his irrepressible optimism, his human decency and his deep love for children. Always looking to develop future leaders, Sackey embraces the premise that an important function of leadership is to produce more leaders. He is attuned to the demands of the profession and expertly identifies and encourages staff with strong leadership potential. He has mentored several aspiring administrators, providing study sessions for their 092 exams, bringing them to professional development events, and helping them navigate the certification process. Sackey graduated from Guilford College (NC) in 1998 with a bachelor of science degree in justice and policy studies. He went on to earn two master’s degrees, one in special education from Manhattan College (NY) and the other in school administration and supervision from Mercy College (NY). In 2000, he became a special intervention teacher in the New York City Public Schools and continued there as a special education teacher, supervisor and assistant principal until 2008 when he was appointed to his present position in Greenwich. Sackey is currently completing his work for a doctorate degree in educational leadership, management and policy from Seton Hall University (NJ) with an anticipated graduation date of later this year. Sackey has been selected by CAS to represent Connecticut in the National Assistant Principal of the Year Program sponsored jointly by the National Association of Secondary School Principals (NASSP) and Virco, Inc. Sackey, along with assistant principals from each of the other fifty states, as well as the District of Columbia and the Department of Defense Education Activity associations, will compete for the national honor. Joseph Blake, assistant principal of Suffield High School (SHS), has been named the 2014 CAS High School Assistant Principal of the Year. Though an assistant principal at SHS for only two-and-a-half years, Blake’s efforts and influence have dramatically shaped the culture and climate of the school and community. Nominated for the award by his principal, Donna Hayward, Blake is a leader without pretense or self-interest who is known for his equanimity, his unerring professionalism and his resolute commitment to all members of the SHS community. States Guidance Department Chair Ned Sullivan, “Sometimes I forget that Joe has only been here for a few years. His easy-going manner and poise under pressure have impressed me from the start, but his natural people skills – the ability to poke fun at himself and deflect credit for a job well done onto others – is where he really stands out.” Blake leads by example, always exhibiting the characteristics of integrity, respect, and kindness that he works to instill in his students on a daily basis. “Joe is honest and ethical, maintaining the highest standards of personal conduct at all times,” says Hayward. Since his arrival at SHS in 2011, Blake has introduced a number of new technologies to streamline building management and improve classroom instruction. This past year, he worked with colleagues to guide the staff through a comprehensive technology competencies assessment. The results were used to design individualized online learning activities which helped each teacher to more effectively integrate technology into his/her classroom. Furthermore, he spearheaded the school’s transition to online scheduling, resulting in a 29% decrease in scheduling conflicts. Blake received both his bachelor and master of science degrees from Southern CT State University. He went on to earn his sixth year certificate from Sacred Heart University in Fairfield, CT. He began his career in education in 1997 as a teacher at Lafayette Elementary School in Shelton. He quickly transitioned to the high school where he taught social studies for three years and, in 2001, was appointed assistant principal at Torrington High School. In 2004, he became housemaster at Fairfield Ludlowe High School and remained there until 2011 when he assumed the assistant principalship of SHS, the position he now holds. In this new era of shared leadership, the assistant principal’s role has become multi-dimensional. No longer does the assistant principal only deal with student discipline and attendance. Today’s assistant principal is often responsible for curriculum and instruction, staff evaluation, community partnerships, public relations, technology, student activities, and many other crucial areas of operation. The Assistant Principal of the Year Program, sponsored annually by the Connecticut Association of Schools, was established in 1990 to bring recognition to the assistant principalship and to spotlight the critical role that assistant principals play in the education of our youth. The program recognizes outstanding school assistant principals who have succeeded in providing high quality learning opportunities for students. These administrators have demonstrated excellent leadership, commitment to staff and students, service to their communities, and contributions to the overall profession of educational leadership. Each year nominations are solicited for an Elementary, Middle Level, and High School Assistant Principal of the Year. The winners are chosen by a selection committee consisting of active and retired principals and assistant principals. State assistant principals of the year must demonstrate success in the areas of collaborative leadership; personal excellence; curriculum, instruction, and assessment; and personalization. All applicants must have been in an assistant principalship for two (2) years or longer. Established in 1953, the Connecticut Association of Schools (CAS) is a non-profit educational organization which supports the interests of Connecticut’s K-12 schools and works to improve educational opportunities for the students of our state. A leader in Connecticut’s education community, CAS represents over 800 of Connecticut’s public and parochial schools. CAS is affiliated with the National Association of Secondary School Principals, the Association for Middle Level Education, the National Association of Elementary School Principals, and the National Federation of State High School Associations.